Simpulse's SL100 Long-Range Radio Link Modem operated in a UAV on a surveillance mission over sea. During the mission, the modem delivered 3 Mbit/s of video at 55 km distance with 0.4 W transmit power and Simpulse's tracking antenna at ground. 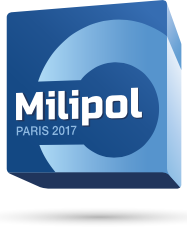 Visit Simpulse at Milipol Paris 2017, the leading event for Homeland Security. Simpulse is located on the CCI Seine-et-Marne stand H 175. Simpulse recruits an Embedded Software Developer, dedicated to the development of Simpulse's SDR modem. This position is based at Simpulse's headquarters in Palaiseau, France. Candidates are invited to send CV and letter of motivation to: contact @ simpulse-dsp.com. The White Paper demonstrates how Software Defined Radio and innovative technology ensure reliable transmission of live video and control command on long-range UAV missions. The paper outlines the techniques used in Simpulse’s SL100 mobile data-link modem, and further details the modem’s implementation in a professional UAV system and its performances on a long-range mission in the field. An absolute must-read! Simpulse announces the company joined the Alliances program of DSP integrated circuit provider Analog Devices Inc. The company's complementary capabilities include Digital Signal Processign and system-level design. Simpulse's recently released SL100 Mobile data-link modem uses innovative SDR and signal processing technologies, including ADI's RadioVerse AD936x integrated wideband RF transceiver.